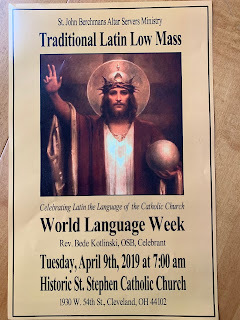 The preparatory season of Lent, culminating in the exhaustive, yet thoroughly edifying and glorious week that we call Holy, the Sacred Triduum, being behind us, these are some moments captured. Let your Paschaltide be equally memorable. Having fasted from the Gloria of the Mass through most of Lent, we are given a gesture of good things to come in the Mass of Maundy Thursday, so-called for the mandate Our Lord gave to the Apostles to imitate Him, as He washed their feet. 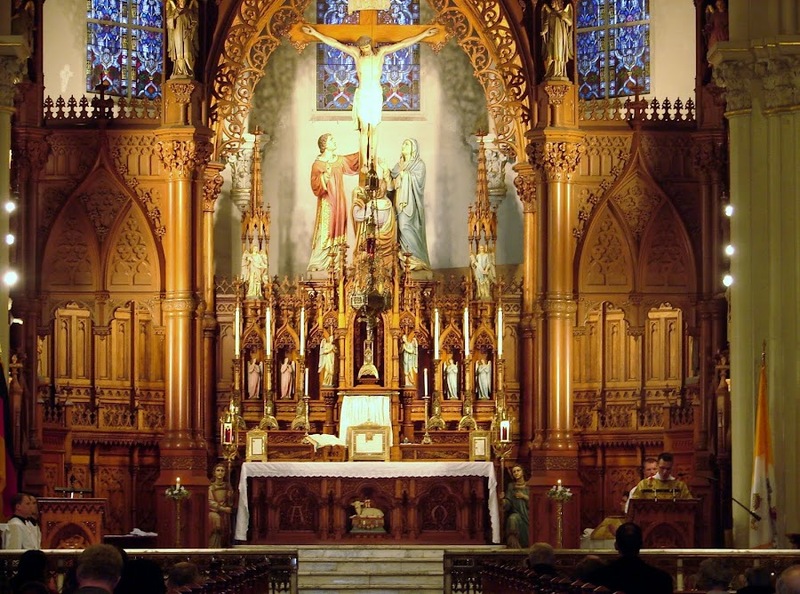 In anticipation of Good Friday, a liturgical day that does not see to the Consecration of bread and wine, Our Lord in the Most Blessed Sacrament is carried in procession to an altar of repose. As was said, no Mass with Consecration is offered this day. Rightly said, no Mass is offered on Good Friday. The altar, being stripped after Mass, quite simply reminds us that the altar represents Christ, and that He was stripped of His garments, having fallen into the hands of the Jews and exposed to vicious insults. See the Catholic Encyclopedia. The Adoration of the Cross is essentially unchanged from the way it was celebrated as far back as the 4th century. Thanks be to God, a relic of the True Cross, along with other precious pieces of salvation history, were saved from destruction by the fire at Notre Dame. Christ is Risen, indeed, and offered again, in an unbloody manner, to the Father. Cleveland TLM Friends has joined the Twitter world. As most of our posts are rather short, to-the-point announcements of liturgical events, it may be a very good resource. We know many of you are not modern technologicaljunkies, so we will continue to post here on the blog. But we encourage you to do both! Below is a clip of Fr Bede chanting the first lesson from Jeremiah’s Lamentations, from the Office of Tenebrae, at St Stephen. And here is the reading of the eighth lesson of the third nocturn, by John-Paul Volkenant Jr. 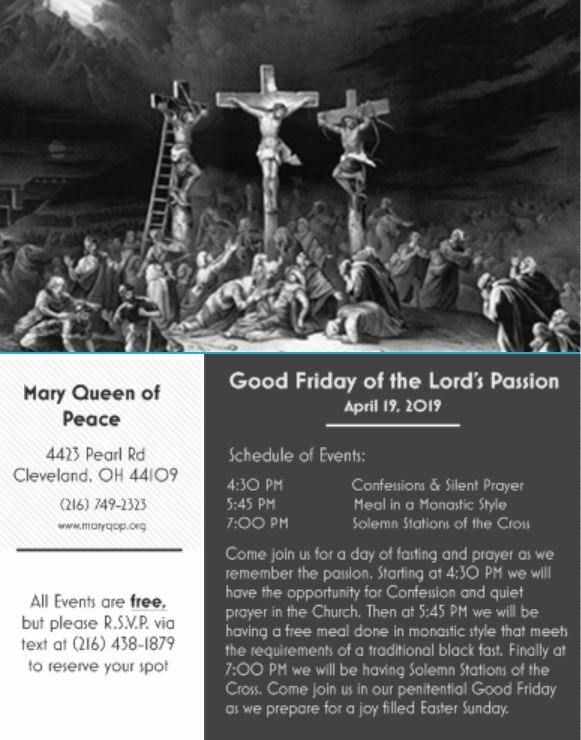 The schedule of TLM events for Holy Week is below. Easter Sunday's schedule of Masses is the same as any other Sunday of the year. Thanks to a Friend for sending this. Please take note that the parish would like for all those interested in attending to notify via text message. 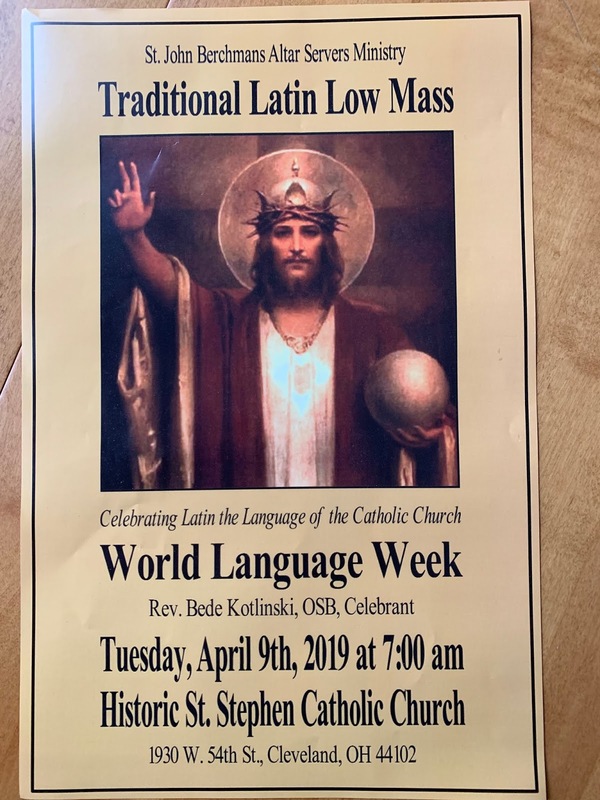 Annually, the St. John Berchman Altar Servers Ministry celebrates a Mass for World Language Week at St. Stephen. This year it will be on Tuesday, April 9th, 2019, at 7am. See the image of the flyer below. 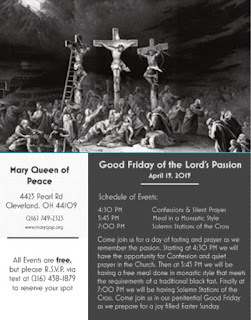 Immaculate Conception in Cleveland has a nice TLM-centered schedule for Friday evenings during Lent. 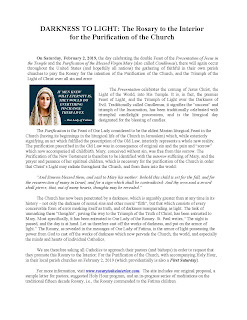 Confessions will be heard prior to a 6pm Low Mass. No specific time is listed for the start of confessions. Following Mass, there will be Stations of the Cross. The evening will conclude with Benediction. Tomorrow’s schedule of Traditional Masses for Ash Wednesday is as follows. 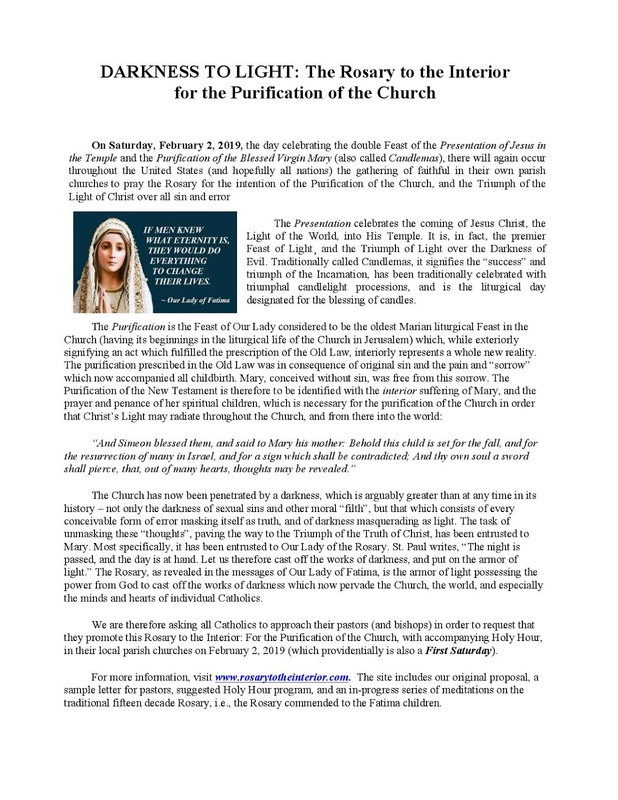 As February 2 is known as the Feast of the Purification of the Blessed Virgin Mary, so it seems a good day to particularly pray for the Purification of the Church.